This striking manuscript comes from the oldest independent country in Africa. It was commissioned in the late 1600s by the emperor for use in his royal city of Gondar. Generously illuminated with distinctive miniature paintings and highly decorative coloured borders, this is one of the most beautiful of the Library’s Ethiopian manuscripts. Its many illustrations include Moses, Aaron, Ruth, Eusebius, John and Carpanius, scenes from the life of Christ, and portraits of the Evangelists. 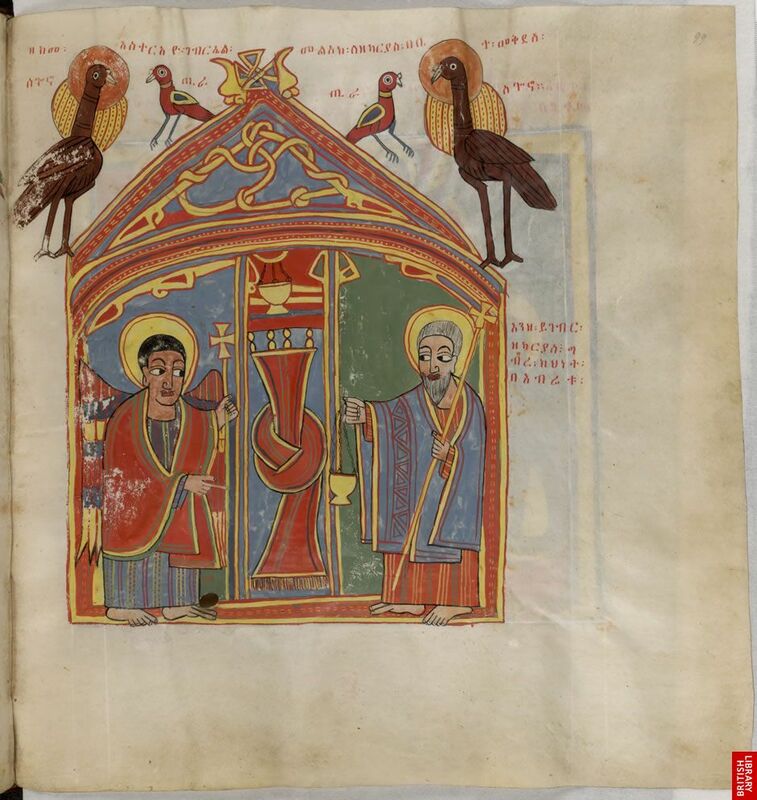 Ethiopic Gospels: Annunciation to Zacharias – The Gospel of St Luke begins with a description of the events surrounding the birth of St. John the Baptist. According to his account Zacharias, a priest, was burning incense in the Temple of the Lord when the angel Gabriel appeared to him and told Zacharias that he would have a son, who would ‘make ready a people prepared for the Lord’ (Luke 1: 17). This event is shown here: Zacharias is on the right, holding a censer. The Temple in Jerusalem is shown as if it were a circular, Ethiopian church. Inside, both the angel and Zacharias hold staves with crosses, similar to the processional crosses that are used in Ethiopian services. Ostriches on either side of the roof recall pairs of peacocks in images representing the Fountain of Life, often represented in Canon tables. A gospel recounts the life of Jesus of Nazareth and his teachings, which form the foundations of the Christian faith. Jesus lived in Israel during the Roman occupation of the country. His claim that he was the Messiah caused the conflict with led to his crucifixion by the Roman authorities. After his death by crucifixion and subsequent reports of his rising from the dead, followers of Christ – meaning ‘the anointed one’ – developed his teachings into a new faith, independent of Judaism but keeping much of its scriptures. Several gospels had been written by disciples of Jesus during the centuries following his death, but only four were authorised by the Council of Nicaea in 325 for inclusion in the Christian Bible. These four were attributed to St Matthew, St Mark, St Luke and St John, who are known as the Four Evangelists. Christianity took root slowly in Ethiopia from the third decade of the 4th century. Some 150 years later, missionaries from Syria translated the Bible into Ethiopic. The Islamic conquest of neighbouring Egypt in 640-641 isolated Ethiopia from other Christian countries for the best part of a millennium. The Ethiopic Church was able to maintain only tenuous links with the rest of Christianity through the Coptic Church in Egypt, which managed to survive under its country’s Islamic rulers. Why are the Ethiopic Gospels important? Besides the Four Gospels, this manuscript also contains the first eight books of the Old Testament – scriptures inherited from Judaism – and other religious texts. The Bible of the Ethiopic Church preserved some writings that were rejected or lost by other Churches, such as the ‘Book of Jubilees’, the ‘Third Book of Ezra’ and the ‘Apocalypse of St Peter’. The Ethiopic Bible has a total of 84 books, compared to the 66 books of the King James, or Authorised, Version of the Bible. Some of these are translations from Greek, Syriac and Coptic texts no longer known in their original languages. Neither the scribe who copied the text nor the artist who painted the miniatures is named. However, historical notes added to the manuscript suggest it was made for a church of the Emperor Iyasu I Yohannes. Art Christian art and learning flourished in the city of Gondar during his reign from 1682 to 1706. This manuscript was probably intended for its most beautiful church, Dabra Birham Selasse, meaning ‘Mount of the Light of the Trinity’. It was dedicated in 1694 and stands on high ground just outside the city, enclosed by tall walls. The interior is spectacularly painted with biblical subjects in distinctive Gondaran style. This copy of the Ethiopic Gospels is a replica of a precious illuminated manuscript from the early 15th century. It was written and decorated in Gondar, or perhaps at the mountain monastery of Ambra Geshen. The text is in Classical Ethiopic, or Ge’ez, the language of the Ethiopian Church. Together with Assyrian and Babylonian, it differs from all other Semitic languages in being written from left to right, rather than right to left as in Arabic and Hebrew. The scribe’s small elegant script is typical of the late 17th century. Thanks Tsedey for bringing up this subject. A lot of killing in the world, from the time of Adam and Eve until the end of the ages falls upon the religions of the world. Many religions suppressed truth, and tried to keep the people in darkness and subject to their assumed power and authority. They killed the Prophets, the Apostles, and the Righteous, any who loved the truth and guarded the inspired words of Scriptures, including such important writings as the Book of Enoch, Jubilee and others. “In her was found the blood of all who have been killed on the earth.” (From Revelation 18). The Ethiopian church its fathers kept these priceless and timeless documents to all humanity. Many people are turning their attention into these so-called “apochryphal” books. But many still ignore facts and have chosen to remain blind. P.S: The Ethiopian Orthodox Church has 46 books of the Old Testament and 35 books of the New Testament that will bring the total of canonized books of the Bible to 81. Not 84! ~~~The largest Bible is that of the Ethiopian Orthodox church, which has 81 books. ~~~The smallest Bible is claimed by the Samaritans, who recognize only the first five books of the Bible (the Pentateuch). You’ve probably notified the author of the article about it. I just did. Thank you for your detailed comment. Indeed, people need to ‘wake up’ and KNOW the truth!